Pyle rear view backup parking assist camera & display monitor system kit, waterproof license plate mount night vision Cam, angle adjustable, auto reverse activation, distance Scale lines - system features: - kit includes rear view mirror monitor assembly + backup camera - includes all necessary installation cables/wires - backup/reverse camera trigger - (automatically activates when placed in reverse Gear) - on-screen rear view distance Scale line display - -mirror monitor: - easy setup: replaces your existing rear view mirror - 4.3" LCD display built-into mirror panel - ability to connect up to (2) video sources - RCA video connector types - aspect ratio: 16:9 - video system: PAL/NTSC - LCD display: on/off - size: (L x w x H): 10.6" x 3.5" x 1.8" - power: DC 12V - -camera: - marine grade camera construction - waterproof & fog resistant (IP67 rating) - low Lux light performance (0.2 Lux) - preferably mounted above the rear license plate - tilt adjustable camera lens angle - 420 tvl Horizontal resolution - true color reproduction - total pixels: 656 x 492 - resolution: 420 TV lines - viewing angle: 170 degree - auto White balance - video Output: 1.0V pp-75 ohm - power supply: DC 12V 200mA - size: (L x w x H): 10.0" x 1.3" x 1.26" - Pyle model: PLCM4550. BACKUP CAR CAMERA:A rugged backup rear view camera with true color reproduction and video output of 1.0V PP-75 Ohm. It has a low lux performance and a wide viewing angle at 170°. Has color image reproduction and auto white balance. LCD MONITOR SCREEN: This backup camera monitor comes with a 4.3" LCD mirror monitor screen display and NTSC/PAL video system. 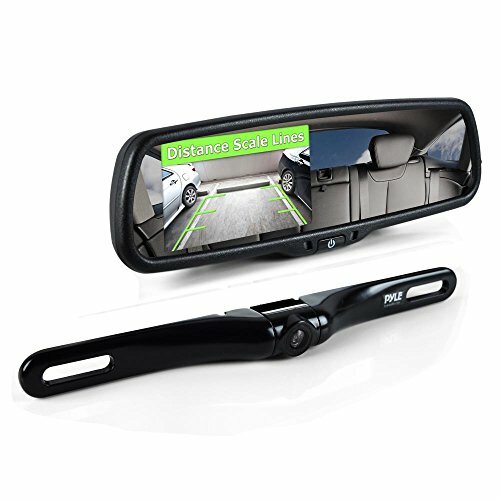 Has a built-into rearview mirror assembly with universal sized clips. Also has the ability to connect to 2 video sources. BUILT-INTO MIRROR PANEL: This backup camera monitor can be easily setup and replace existing rear view mirror. On the other hand, the car rear view camera, can be mounted to license plate with its slim bar style housing. DISTANCE SCALE LINES: A backup camera kit that features an accurate distance scale line display for proper parking and reversing without relying on side mirrors alone. This reverse parking sensor offers safety for jeeps, pickups and other automobiles.